Please join us for the whole weekend whether you ski or not. There is something to do for everyone! It is located 2,543 meters above the sea level. It has two ski areas which are connected by several lifts and passages. All the ski runs on this mountain are suitable for skiing and snowboarding 🏂 . The mountain consists of two winter sports areas. The first area has ski runs for mostly beginners and intermediate skills. The second area has more longer and wider runs with many intermediate, advanced and pro levels.There are blue, black and black diamond runs available. With a purchase of daily or weekend pass, you can ski unlimited, and change between the areas as many times as you wish. 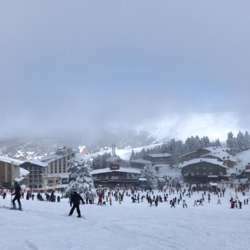 Right now the conditions have been reported as “great” snow level being 200cm. Are you not a winter sports person however you like to get a fresh mountain air, have fun and enjoy the beautiful scenery? Uludag can offer you cafes & restaurants with amazing views either by the slopes or very top on the mountain. You will pay 30tl for a round trip passenger lift to get up there 👆 to enjoy specially made “warm wine” “sicak şarap”, have sucuk-ekmek and watch the skiers. If you like to spend some time in the hotel, it has a nice large lobby with a big fire place and also a very nice lounge with a view on the second floor. We highly suggest cross-country skiing (basically walking with easy skies) or hiking. The hotel is located in the First Area, with a ski lift next to it. Therefore, you don’t need to walk long or take a shuttle. You will be able to switch to the Second Area easily. The package is “Full-Board”, including tea time in the afternoon with freshly baked goodies. Early morning (starting 4am from Beylikduzu making several stops after) the bus will pick us up in Istanbul from different locations and take us to our hotel in Uludag. We will go straight to ski rental and get ours for a discounted price of 40tl per day. Friday night, after dinner, we have an option to go to a sports bar or for a live music at Grand Yazici, hang out at one of the winter fest venues or stay at hotel to relax. Saturday night the hotel will arrange a live music for us 🎶 🎼 🎵 (on the house). One of our councils will sing for us!! We have known the guitarist for many years now, and I guarantee you an amazing fun night!! For the departure times and places please PM me.